There was extra reason for celebration this past week when on Tuesday November 24th Edenderry corner forward Sean Doyle was crowned the Offaly senior football player of the year 2015 after scoring 4-29 in Edenderry's successful march to regaining the Dowling cup. 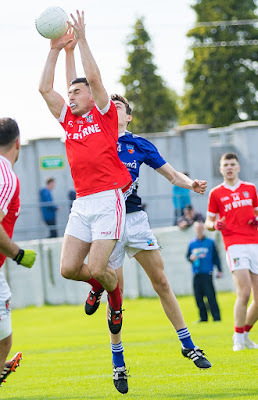 Doyle's accuracy off the right or left boot proved instrumental for the reds and Doyle starred in eight of Edenderry's nine championship matches this year, only missing the round 7 game of the group stages v Tullamore which coincidentally was the only game Edenderry lost in 2015. The former St Mary's college's All-Ireland winning corner forward has gone from strength over the past few years and this has culminated with him joining Pat Flanagan's Offaly panel for 2016. Everyone from Edenderry GAA would like to congratulate Sean on all his success and best wishes for the future.